Stampin' Up! Sale-a-bration 2011 starts TODAY! Join the Stampin' Up! Sale-A-Bration 2011! When you host a workshop of at least $395 (before tax and shipping), you'll receive a free Sale-A-Bration reward in addition to all of the regular hostess benefits! Contact me today to schedule your Sale-A-Bration workshop. The Sale-A-Bration promotion starts TODAY January 25 and runs through March 31, so don't miss your chance to earn free products! Talk to me, Jennifer DiMarco, today to book your workshop or learn more about this promotion. I have a full-colour Sale-A-Bration brochure full of beautiful project ideas you can make using these limited-edition Sale-A-Bration sets. Contact me to get one in your hands! See my previous post for all the Stampers Club benefits! New Club Starting February 2011, email me now to join or for more information…it’ll be a blast!!!! Want to earn a FREE STAMP SET and at a FREE SHOPPING SPREE in the Stampin’ Up! Catalogue? AND a Free Catalogue & Idea Book! VIP Technique Tutorials…Each month, I will create a detailed tip sheet to of our monthly techniques that you can keep as a resource! Start A Club With 5 Of Your Friends! Do you have your 2011 Sale-a-bration Mini Yet? If not email me and I'll pop one in the snail mail to you! Sale-a-bration starts January 25th, 2011 ! Don't miss your FREE Products! Above is a sneak peek at one of my favourite Sale-a-bration (SAB) Stamp Sets for 2011- Bliss !! How do I place a Stampin' Up! order or book my workshop or class? 1.Phone me at: 514-603-4594 ! 3.Orders will be delivered direct to your door via UPS! Ribbon Grosgrain Polka Dot Soft Suede 1/2"
1. Apply sentiment Rub-On to Kraft card. 2. 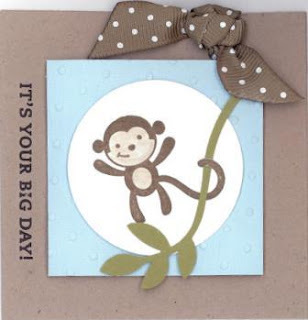 Stamp monkey in Soft Suede ink on Whisper White card stock (2-1/2" x 2-1/2"), and punch out using 1-3/4" Circle punch. Colour face and stomach using Soft Suede ink and blender pens, and slit small hole on each side of tail. 3. Punch branch from Old Olive textured card stock using the Extra Large Two-Step Bird punch, and slide branch through holes on monkey tail. 4. Punch hole in card using Crop-A-Dile and tie ribbon through hole and around bottom of card. 5. Emboss Bashful Blue textured card stock (2-1/8" x 2-1/8") using Big Shot and Perfect Polka Dots Textured Impressions embossing folder. 6. Adhere circle to Bashful Blue textured card stock, and adhere to card using Stampin’ Dimensionals Stamp monkey image in Soft Suede ink on envelope. •Card Stock Very Vanilla 8 1/2X11 ◦2.25" x 3.5"
•Card Stock Not Quite Navy 8 1/2X11 ◦6" x 6"
◦Use to punch three flowers. 1. Stamp “You’re important” image repeatedly in Not Quite Navy ink on Not Quite Navy card. 2. Adhere Certainly Celery grosgrain ribbon to card, and accent using staples. 3. 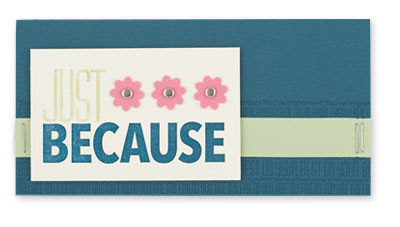 Stamp “Just because” in Certainly Celery and Not Quite Navy ink on Very Vanilla card stock (2-1/4" x 3-1/2"). 4. Punch three small flowers from Regal Rose card stock using Boho Blossoms punch, and adhere to Very Vanilla card stock. Attach Silver brads to center of each flower using 1/16" Circle punch. Adhere Very Vanilla card stock to card using Stampin’ Dimensionals. 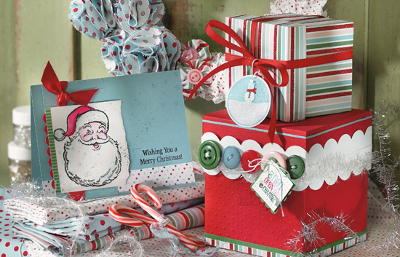 Punches are a quick and easy way to add interest to your cards and scrapbook pages. You can use the punched out card stock pieces—or you can use the remaining outline piece to create a reverse effect. We have all types of punches that have an easy-to-use thumb punch lever which makes punching out card stock an effortless task. How do I order Stampin' Up! Products or Book my Party? Stampin' Up! Occasions Mini Catalogue 2011 Released TODAY! How do I order Stampin' Up! Products or Book a Workshop? 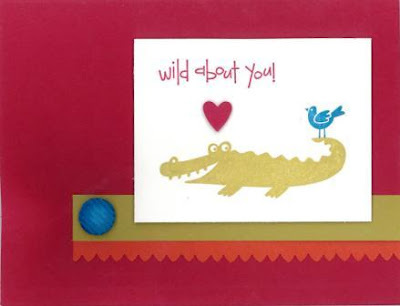 Wild About You Card - so cute! 1. Scallop bottom edge of Tangerine Tango card stock (4-1/2" x 1") using Scallop Edge punch. Move punch slightly to one side and punch again to create smaller scallops. Adhere Tangerine Tango card stock to Riding Hood Red card. 2. Punch hole in Kiwi Kiss card stock (4-1/2" x 5/8") using 1/16" Circle punch, attach Pacific Point corduroy button, and adhere to card. 3. Stamp “Wild about you” in Riding Hood Red ink, alligator image in Kiwi Kiss ink, and use Stamp-a-ma-jig to stamp bird image in Pacific Point ink on Whisper White card stock (3-1/4" x 2-1/2"). 4. Punch small heart from Riding Hood Red card stock using Heart to Heart punch and adhere to Whisper White card stock using Stampin’ Dimensionals. 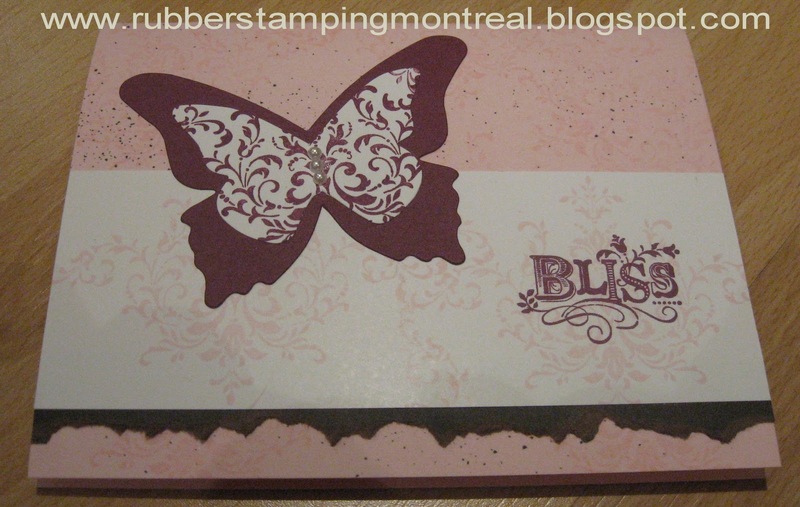 Adhere Whisper White card stock to card using Stampin’ Dimensionals. How do I order Stampin' Up! Products? Tomorrow is the last day for the Holiday Mini Catalogue! Just a friendly reminder that Monday, January 3rd is the last day to order from the Holiday Mini Catalog! Don't delay – once this catalog expires – these sets may or may not be in the new catalog when it is released in July 2011!